Car Problems? NG900 or old 9-3 Only If you're experiencing problems with your NG900 or 9-3, post your question in here. CEL Code or GTFO! Well, check the fuse in the fuse box...if that is OK then you'll probably need to pull the any error codes off the system if it has ACC, hold the Auto and Off buttons simultaneously as the car is started. Could be a bad resistor pack....does the fan work at full blast but no other fan speeds? Where is the fuse and the resistor pack located? I don't think it works on any speeds did not really get that much time to check it out I was looking for the fuse then he had to go. So I did not get to play with the heater controls just took his word for it. yeah you need to hold the off and auto button and the same time. Then come back with the code. Assuming the ACC (automatic climate control) doesn't throw any codes at you (it should come back and read "0", meaning its all good), then the next thing I'd do is check the blower motor itself. It can be fairly easily accessed through the false bulkhead (or aquarium) which is that little area right in front of the windshield where your wiper arms come out of. There are some bolts to get the aquarium cover off, then the wiper motor/arms come off (easier than it looks), then the cabin air filter and the bracket which the filter sits on top of (again, really easy, just a few bolts). Once this is out of the way, it'll expose the connector to the blower motor, check it for power using a voltage meter and/or jumper 12volts to the blower motor and see if it comes on. If it does, its your ACC (climate control screen/computer thing) or your resister pack (basically limits voltage to the blower motor which in turn dictates how fast the motor runs). I've had a few of resister packs go bad on my 9000s and one on my ng900, so I'd bet the OG9-3 is no different in that respect. If the blower motor resistor is bad, you will not get an error code through the ACC unit. This is, of course, assuming you Auto Climate Control and not the manual knobs. In any case, the fuse is located on the left side of the dash board. Open up the driver's door, and look at the side/end of the dash. There's a fuse panel there with a handy diagram of what's what. If the fuse is ok, and you know the blower motor is ok, it's most likely the resistor (Saab calls it something fancier). Said resistor is located behind the glovebox. 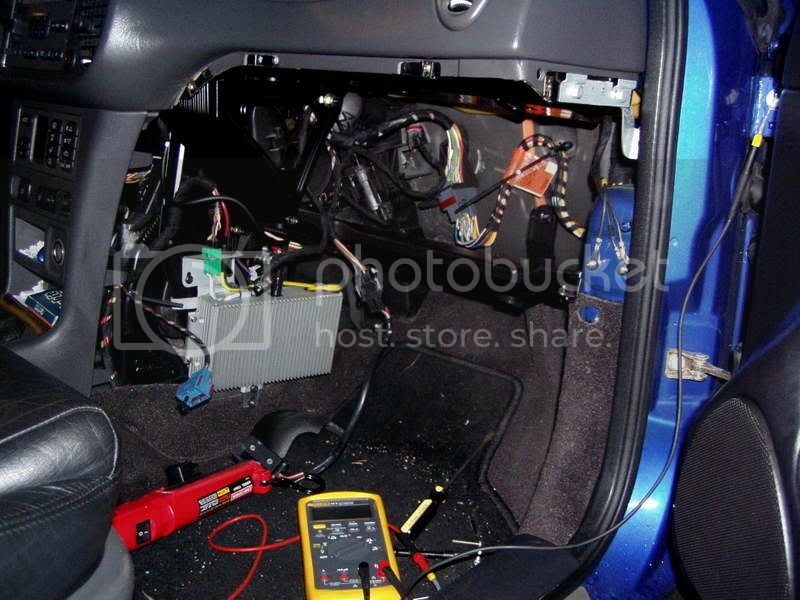 You need to remove the glovebox, a couple smaller trim pieces and the duct going to the passenger side vent. Once it's all out of the way you'll see it in there. The blower motor resistor is the wire that goes down to the floor. I had already removed the 2 bolts holding it in. Alright thanks for the info I will keep you posted on what I find. Do you have any air coming out of the vents? If you have no air, then it's a generally easy fix of blower motor or resistor. At worst the ACC itself. If there's no heat and your coolant level is where it should be, you should look into the control valves and doors inside the dash and such. I don't know on these Saabs, but it wouldn't surprise me if they had a coolant control valve that opened when the ACC unit requests heat into the car. I get air but no heat really. The best way i can get the inside of the car warm is to put the climate control on auo/econ mode. Everything else blows out cool/cold air. Coolent level is fine, fan speeds are fine. Where are these valve located? If i take the dash/ front acc panel off ca i get to it or is it deep and into the heater box? From a quick glance at the WIS, it looks as if there is a Solenoid valve that controls coolant flow to the heater box. Looks to be mounted on or near the firewall, in close proximity to the brake booster. If the solenoid itself is bad you'll get an error code 18 on the ACC, but if no error code comes up, check for vacuum going to the valve itself, which is needed to control the valve. is the brake boost on the drivers side of the engine near the fuse box. Yeah, I have checked the acc for the past month now and only ever get the 0 code. Interpret it how you like, that's just what I've found for now. If I can come up with anything more I'll post it up.